Jazz fans will be familiar with the work of Rudy Van Gelder of Englewood Cliffs, N.J., who has been a recording engineer for nearly 70 years. He’s responsible for capturing some of the genre’s most enduring performances for posterity, with many top artists – the ornery Charles Mingus was a notable exception – choosing to use his talents. Van Gelder had worked with saxophonist John Coltrane on many occasions, dating back to his legendary stint with the Miles Davis Quintet, before Coltrane entered his studio on Dec. 9, 1964. John said very little about what he wanted. If he had certain specifics that he wanted to add to the music or how he wanted it played, he would say it. I think this is so important, because it was an on-the-spot improvisation, honestly approached music, with no pretentions about it at all. The band had played sections of the four-part suite that became “A Love Supreme” during live gigs, but the studio date marked the first time the musicians would attempt to bring Coltrane’s vision together as a coherent piece. All of them were two-track recordings, which eliminated an possibility of mixing later. The advantages of doing one or two tunes at a time in a direct-to-two-track mode allowed me to concentrate more on the balance, mix and overall sound. Yes, we could edit the takes, but we couldn’t change the balance. So, in what truly was a live performance, the quartet launched into one of jazz’s most celebrated recordings. Jones opens by striking a Chinese gong, the only time Coltrane used that particular instrument, according to Ravi, his son. Coltrane then enters on tenor sax with a tuneful E-major flurry before Garrison starts to play the four-note sequence for which the album is best known. “Acknowledgement,” as the first section is titled, builds on the basic 4/4 rhythm as Coltrane solos, starting quietly and building with intensity. Jones adds his usual fluidity to complement the saxophonist before the entire band focuses on the thematic four notes. It’s really towards what he’s about to go into, which is very, very free and non-key-centered improvisation. The way he takes that “a love supreme” motif, and transposes it through all the keys over the ostinato pattern that Jimmy is playing, is a real study. And McCoy is sort of in between, chasing Coltrane, and staying on the same key. Eventually, Coltane starts reciting the key phrase, with Van Gelder adjusting the microphone after it failed to pick up the initial “a love.” He repeats the chant, augmented by overdubs recorded the next evening, until his voice and the other instruments, except for Garrison’s bass, drop out. Garrison plays a short solo segueing into the next part of the suite. Coltrane enters with a flourish to state the section’s theme, one of Coltrane’s more enduring melodies. Compared with what preceded it, “Resolution” hearkens back to the saxophonist’s hard-bop work of the ’50s, focusing on chord changes rather than the modal structure he increasingly came to favor. The final two sections of “A Love Supreme,” titled “Pursuance” and “Psalm,” were recorded together as a single take and appear as a single track on some reissues of the CD. The extended piece starts with a Jones solo, as he provides a demonstration of “the master percussionist’s polyrhythmic approach,” Kahn wrote. Jones was already known for a ‘busy’ style before any cross-cultural sounds exerted their influence, and his distinctive translation of African and Caribbean polyrhythms onto the traditional jazz trap kit involved a democratic use of all its elements. “Pursuance” proceeds in a relatively straightforward manner, with Tyner providing a freewheeling touch by flailing away on a series of inventive piano clusters. Coltrane adds a majestic solo drawing on his “sheets of sound” use of harmonics before returning to the section’s main theme. Again, a Garrison bass solo provides a transition between sections, leading up to a Jones roll on the tympani for the suite’s dramatic conclusion. Like a libretto, the words to “Psalm” (eventually titled “A Love Supreme” and printed on the inside of the album cover) define the lyrical flow of the music; one can follow syllable by syllable. Each line crests and resolves, implying punctuation. And so the John Coltrane Quartet emerged from that Wednesday night session with a full album’s worth of music, although some extra musicians, bassist Art Davis and saxophonist Archie Shepp, joined in for a second session the following night. None of those recordings appeared on the finish product. “A Love Supreme” was released in February 1965 to critical acclaim and commercial viability: It sold some half a million copies in the next five years, Coltrane’s best effort in that regard by a wide margin. The quartet played the entire suite in concert just once, a July 26, 1965, performance at the Festival Mondial du Jazz Antibes, Juan-les-Pins, France, that was professionally recorded and is available as part of Impulse!’s “deluxe edition” CD. The live version is more dissonant than the studio effort, as Coltrane’s music had veered considerably in that direction during the seven-month interim. As a matter of fact, Coltrane had booked a June session at Van Gelder’s studio to record “Ascension,” a 40-minute composition featuring numerous guest musicians improvising in turn. And for the last two years of his life – he died July 17, 1967 – Coltrane explored increasingly unconventional realms; check out his four-CD “Live in Japan” set (consisting of just six songs!) for a representative sampling of what he was delivering. In that context, “A Love Supreme” serves as the bridge between Coltrane’s relatively subdued and wildly experimental periods. And as such, it has turned out to be his most enduring contribution to the world of music. That goes for Rudy Van Gelder, too. In the pantheon of jazz, John Coltrane generally is recognized as the Last Giant; in fact, that’s the title of a somewhat unrepresentative anthology of his work. Among jazz aficionados, Coltrane’s death in 1967 at age 40 left a void that has yet to be filled. And probably never will. Coltrane was about a week short of his 30th birthday when he entered Rudy Van Gelder’s studio in Hackensack, N.J., to record a one-off album for Blue Note Records. At the time, Coltrane was hardly a “giant.” His best-known work was as tenor sax player in Miles Davis’ band, but he lost that gig because of drug problems just as Miles hit the big time by signing with Columbia Records. In the meantime, Blue Note founder Alfred Lion signed Coltrane for a one-record deal, and he recorded it on Sept. 15, 1957, with a lineup drawn partially from Davis’ band: Paul “Mr. PC” Chambers on bass and the inimitable “Philly” Jo Jones on drums. Rounding out the lineup were Kenny Drew on piano, Lee Morgan on trumpet and Curtis Fuller on trombone, an instrumental rarely employed in Coltrane recordings. The day’s work yielded a record that established Coltrane at once as a major songwriting talent and a practically unbelievable wielder of the tenor saxophone. Each of the album’s five songs serves as a showcase for his playing within the friendly confines of eminently listenable tunes. The title track is the most well-known on the album, and perhaps within Coltrane’s immense catalog. The beginning call and response sets the tone for a pice that, throughout its 10 minutes, treats the listener to constant inventiveness among the musicians. “Moment’s Notice” serves as a showcase for each band member showing off his chops, with Drew contributing a particularly melodic piano run before the whole ensemble reprises the upbeat melody. “Locomotion” is the fastest-paced song on the album, which the instrumentalists playing to a theme that might emulate a train ride. “I’m Old Fashioned,” the standard written by Jerome Kern and Johnny Mercer, slows down the pace considerably, allowing Coltrane to demonstrate he could do more than play lightning-fast runs on his horn. The proceedings wrap up with “Lazy Bird,” which despite the title picks the pace right back up. Morgan takes the first solo, and it’s a memorable one, showing the speed and complexity that a brass player can conjure. 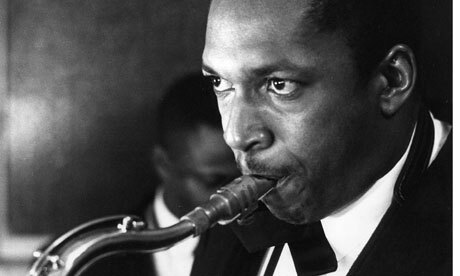 Fuller’s spot is a bit disappointing by contrast, especially when Coltrane follows with his pristine chops. According to Michael Cuscuna’s liner notes in the 1996 CD reissue of “Blue Train,” Coltrane called it his favorite album of his own work. It certainly put him on the map as far as the jazz world was concerned, and it remains probably the most listenable of the many recordings he produced during his relatively short career.